A 4 year old girl died after after climbing into a washing machine and tumbling inside for several minutes when her 15-month-old brother turned it on by accident. The investigators in the Orange County, California, indicated that Kayley Ishii was thrown around inside the machine for about two minutes. A sheriff's department spokesman said controls to the machine were around 20in off the ground, which was unfortunately close enough for the boy to reach. The start switch was a simple push button. Girl suffered "blunt force trauma" and was taken to Mission Hospital Regional Medical Centre following the incident on Monday. Dr. Jim Keany, an emergency room physician at Mission Hospital and CHOC at Mission, was not the attending physician on the girl's case but said it is general practice to work on a child more intensely than an adult. "Children can be very resilient and bounce back," he said. In his 17-year medical career, Keany has never seen a washing machine accident like the one reported in Mission Viejo. 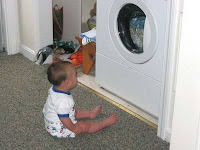 He also wondered how a front-loading washer could start with a child inside it. Keany added that a recent article in the British Journal of Medicine cited 496 washing machine accidents causing injuries, but fewer than 10 percent of them required admission to a hospital. Investigators have talked to Ishii's mother, Mayumi Ishii, regarding the details of the death, he said. Ishii told investigators that she didn't know why Kayley climbed inside the front-loading washing machine. Reuben Ishii, Kayley's father, said the tragedy was difficult to handle. it really so sad. the Parents must take notice of their children. I played hide and seek in the dryer with my brothers when I was a little girl. We used to take flashlights into the dryer and pretend we were in a cave. Sometimes I would go in there to be alone. It had knobs on top, in the back. I feel so sad for the parents. What a shock. I wish I could help them somehow. I used to walk around the house with my head covered in my blanket, that's how I fell down the stairs. I shut the door on my own finger. Children do so many things that are dangerous. I'm truly sorry that this happened. What a sad and tragic loss. My name is reuben ishi too thats really weird.! But i dont have kids. Im sorry for reubens loss.. it is truly sad.